With colors like theses, who could resist ordering?! Through the efforts of the Library of Congress and the Internet Archive, the complete contents of the above catalog is available online in full color. "The real gems of the collection date from 1830 to the 1930s and are both beautiful and important multidisciplinary historical documents. The seed trade catalogs document the history of the seed and agricultural implement business in the United States, as well as provide a history of botany and plant research such as the introduction of plant varieties into the United States. 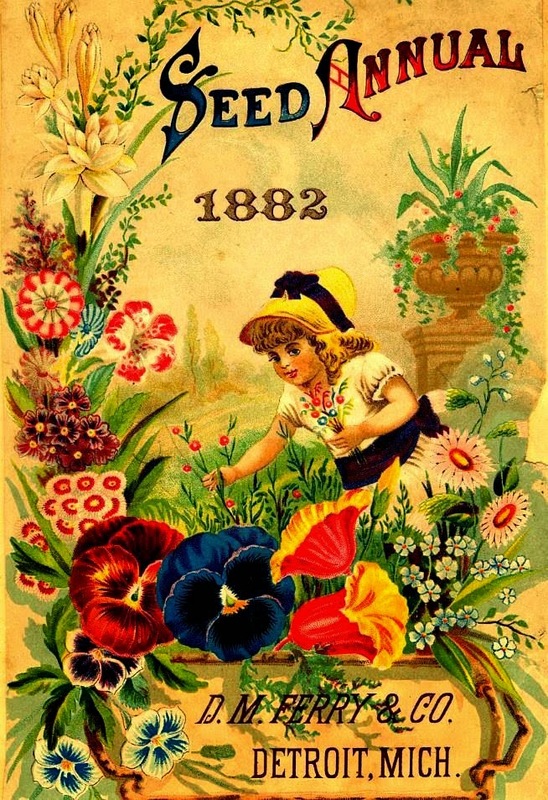 Additionally, the seed trade catalogs are a window into the history of graphic arts in advertising, and a social history, through the text and illustrations, showing changing fashions in flowers and vegetables." Their bibliography is excellent for those interested in doing further research. The Oregon pages discuss catalogs from their earliest inception to 1960. For information on D.M. Ferry & Co., see page 137 of the Earl J. Arnold Advertising Card Collection.